Ten people who took part in an immigration rally in downtown San Diego last month, during which two of them rappelled off the 16th floor of the Westin Gaslamp hotel to hang a large banner, have been charged with misdemeanor trespassing and resisting or delaying officers, City Attorney Mara Elliott announced Tuesday. 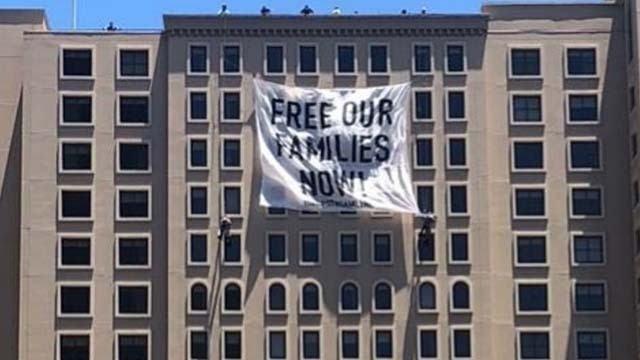 All 10 defendants — associated with the Mijente activist group — entered the hotel with the intent of trespassing on Westin property, blocking its roof access in order to hang the banner that read, “FREE OUR FAMILIES NOW! #STOPSTREAMLINE,” and rappelling off the side of the building without permission, Elliott said. Five defendants went to the roof. Three appeared to be “spotting” the two who rappelled off the side of the hotel, the city attorney said. The other five defendants blocked and/or delayed hotel and law enforcement personnel from accessing the roof, some by chaining themselves inside a stairwell, she said. “I sympathize with the protesters’ message that families should not be torn apart, but do not condone their tactics,” the city attorney said. “Their actions required a robust public safety response. Hilary Nemchik of the City Attorney’s Office said arraignment is set for Sept. 24 in San Diego Superior Court. She said the defendants can be arraigned by fax or at the counter in the business office, or appear in court on the arraignment date. The two alleged rappellers, both charged with trespassing, were identified as Kevin Chun Pang, 24, of Columbus, Ohio, and Brittany Renee Baker, 29, of Berkeley. Ethan Michael Buckner, 28, of Oakland; charged with trespassing to interfere with a business and resisting or delaying a peace officer. Roberta F. Capoblanco, 27, of San Francisco; charged with trespassing and resisting. Katherine Nicole Wires, 31, of Oakland; charged with trespassing and resisting. Nora Wagner Rasman, 33, of Washington, D.C.; charged with trespassing and resisting. Nora Rachel Leccese, 26, of Boulder, Colorado; charged with trespassing and resisting. Brianna Latrell Gibson, 27, of Brooklyn, N.Y.; charged with trespassing. Jaque Fragua, 31, of Jimenez Pueblo, N.M.; charged with trespassing. And Avery Sinclair, 23, of Washington, D.C.; charged with trespassing.